We have been making split screen plugins for video editors for years. It’s one of our oldest and most popular products, and it has gone through many different iterations over time, as your tastes and requirements as editors have changed, and as our abilities as plugin developers have improved. It’s a basic tool, and it’s fun. Incredibly easy and fast UI. Pick a split screen template, and click to place your video. That’s it. Customize almost anything. Once you’ve picked your template, you can immediately customize it by dragging borders around adjusting the onscreen controls. It works the way you’d hope and expect. Compatible with both Final Cut Pro X and Premiere Pro. Built-in animations. Choose an animation type, an in point, and an out point. Your split screen is now animated. 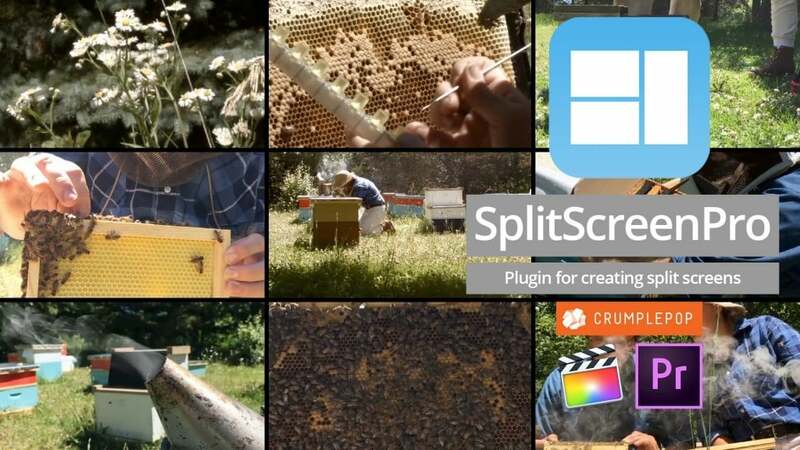 SplitScreen Pro makes elaborate and beautiful split screens simple to make, and it’s fun to use. If you like, you can download the free trial and give it a try. Enjoy! 100% of our customers are FCP editors. They range from ambitious freelancers, to ad agencies, to Hollywood post shops, to in-house editors at the BBC. We believe that the vast majority of these editors – and probably you, too – will be using FCP X as their professional editing platform within a year. Over the last few years, we have corresponded personally with hundreds of FCP editors, helping them with technical problems, workflow issues, and generally doing our best to win them over as customers. Because of this, we have a very good sense of who uses FCP and why. So as we’ve been looking at FCP X, we’ve been trying to figure out: a) Is FCP X the end of our business? and b) What does FCP X mean for our users? Our learning process has been to use FCP X extensively, and also to develop for it. We just shipped one of the first 3rd-party effects developed specifically for FCP X. Our conclusion is that FCP X will be the best option for the largest number of professional editors going forward. We have started to port all of our products to FCP X, and hope to have this complete by late summer 2011. We won’t be supporting another NLE. It’s tempting to speculate about the heated internet reaction to FCP X and the psychology behind it. But we won’t. Instead, let’s take a look at why FCP X will be the preferred option for professional editors. There’s no way to overstate the importance of this. Editing with FCP 6/7 had over time become an increasingly technical proposition, as HD codecs proliferated. FCP X, in contrast, attempts to make your project “just work”, no matter what random codecs you throw at it. It doesn’t do this perfectly, but it’s very, very good. This means that editors can now spend more time editing, and less time being video technicians. For us as developers, FCP 6/7 required that we support 50 different codec/framerate/resolution combinations. With FCP X, we only have to support one codec – or rather zero, because FCP X has abstracted away the codec particulars. For editors, this means that you can focus on getting the project out the door, rather than googling why your client’s asset is showing up as “1888×1062”. When you are ready to export, you have a choice of high-quality codecs, all the way up to ProRes 4444 or TIF sequence. What do most of our customers have in common? Whether they are tiny shops or work at large media entities, they are all being asked to do more with less and turn it around quickly. When you are on a deadline, needing to render -again- in order to get a new cut to the client is a serious hit to productivity and discourages iteration. The incredible performance of FCP X – and it is incredible – makes this obstacle disappear. Even with nasty h.264 footage straight off of your 5d, you can apply color grades, then crop, scale, and rotate all in real time. And not “real time” in the FCP 6/7 sense. It actually works in real time – before your eyes – in a way that seems to defy the laws of nature. This is incredibly practical for anyone who has to turn projects quickly for a client. Even if you’re working with nicer acquisition format – AVC-Intra, let’s say – reshuffling a stack of filters in FCP 6/7 would still bring things to a crawl. In FCP X, your can delete filters, add new ones, and immediately play the result with no rendering. That means the latest revisions your client requested take minutes to preview instead of hours. FCP X’s performance also means that your existing hardware investment just became more valuable. Here at CrumplePop, we have FCP X installed on a number of 2010 dual-core iMacs, a 2010 dual-core Mac Mini, and two 2007 quad-core Mac Pros (we try to avoid developing on fancy equipment, so that we have to “eat our own dog food”, as they say). The iMacs and the Mini are now all being used as realtime editing stations. The 2007 Mac Pros required new graphics cards ($250 each), and now they perform extremely well, handling heavy-duty editing and development on a daily basis. For small and medium-sized shops, this is money in the bank. The fact that it was Apple – a company that primarily sells hardware – who made this possible is remarkable. With the notable exception of Mark Spencer, very few people are talking about the full integration of Motion 5 within Final Cut Pro X. But this was a huge move by Apple, has no precedent in any other NLE, and is the single biggest plot twist for us as a company. It means that anyone with $49 can now purchase Motion and develop high-performance effects for Final Cut Pro X, without learning an API or even coding. We have now looked at this feature set very closely, have developed a product using it, and can confidently report: It works. The quality and care that went into the Motion integration are at times mind-boggling. This means, as Apple suggested in their recent FAQ, that there is now a whole new platform upon which third-party developers can create effects for FCP X. As other new developers like CrumplePop spring up to take advantage of this platform, professional editors will benefit from a whole new crop of ingenious effects that will save them time and delight their clients. As developers for FCP, we have a strong bias in favor of FCP’s continued success. That said, we had spent much of the year prior to FCP X’s release expecting that we might have to leave the platform. We were hearing the same rumors that everyone else was – that FCP X would be another iMovie, wouldn’t be pro, etc. – and we were ready to bail. Happily, we don’t have to. While there are obviously missing features (like a comprehensive redo of Compressor), the foundation of FCP X is extremely solid. FCP X, for the reasons listed above, is going to be what most professional editors use to edit. Maybe not tomorrow, but likely within a year. In many ways, FCP X is ten steps forward, three steps back. It’s not perfect, but as a company, we’re comfortable betting everything on it.